How to get there: From Stanford University, take 280 to 85 and 85 to 101, going south to Gilroy. This distance is 55 miles (88 km), it should be obvious how to travel from any Bay Area location. Just south of Gilroy, exit 101 and enter Hwy. 25 going to Holister. Measure from the point where you enter Hwy. 25. Continue through Holister along Hwy. 25, pay attention as this route makes a couple of sharp turns before leaving town. At mile 24.6 (km 39.6), leave Hwy. 25 and take Hwy. J1 left. This is in a small place called Paicines. This road is quite fun to drive as it winds its way between hills in a landscape that few California tourists normally visit. At mile 53.4 (km 85.9) there is a road going left (east) to Interstate I-5. This area is called Panoche. Continue straight and fork right at mile 56.6 (km 91.1). 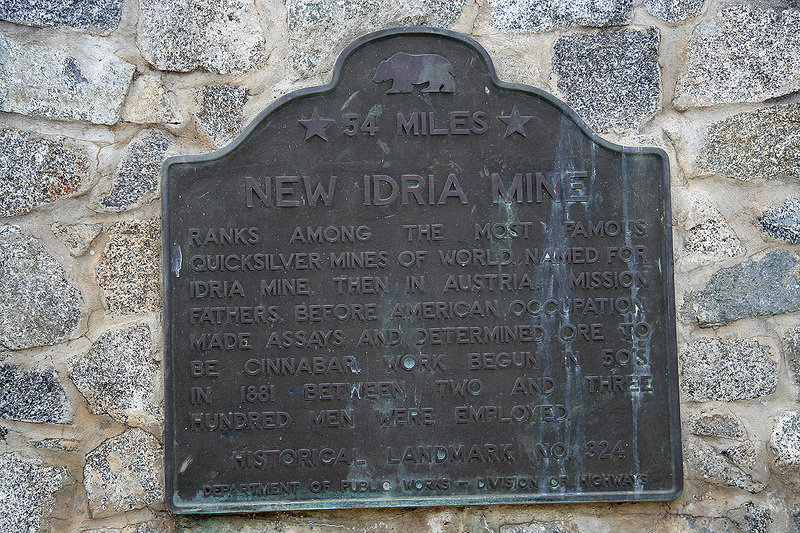 There is a sign here saying New Idria - 22 miles. 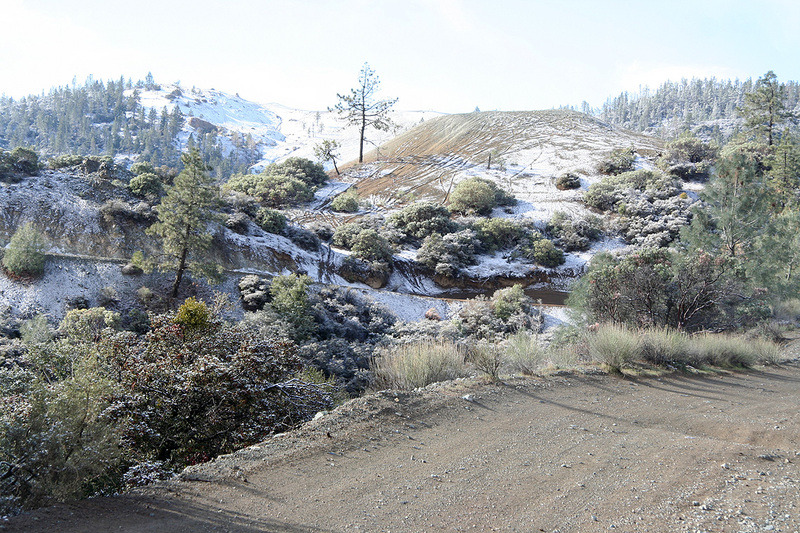 The road is still paved, but somewhat more narrow as it crosses into a new small basin on the eastern side of San Benito mountains. 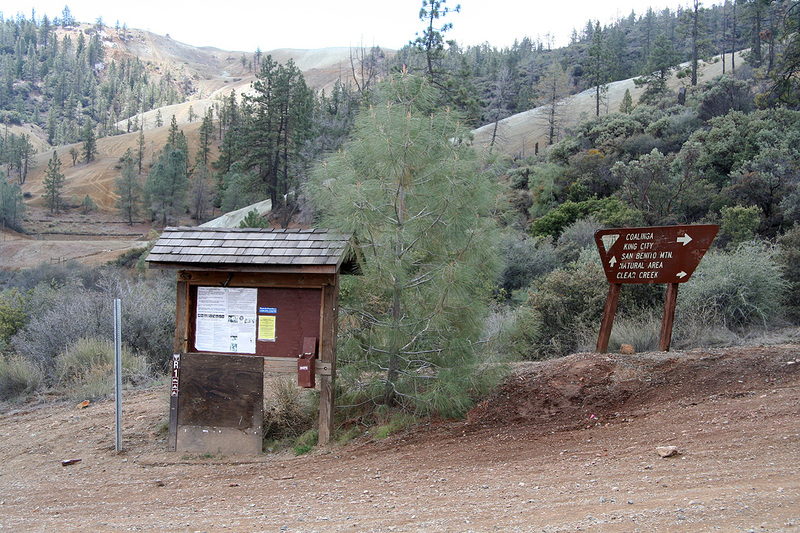 At mile 77.8 (km 125.2), there is a sign advising that the county road ends. Further driving at your own risk etc. The quality of the road does indeed get much worse, there are a couple of sections that barely may be negotiated by a passenger car. 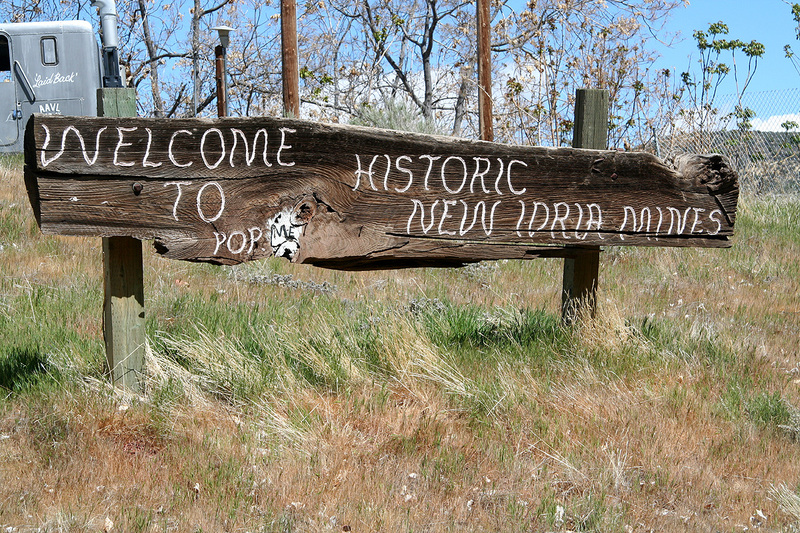 Shortly, you arrive in the old mining town called New Idria. The town appears to be a ghost town. 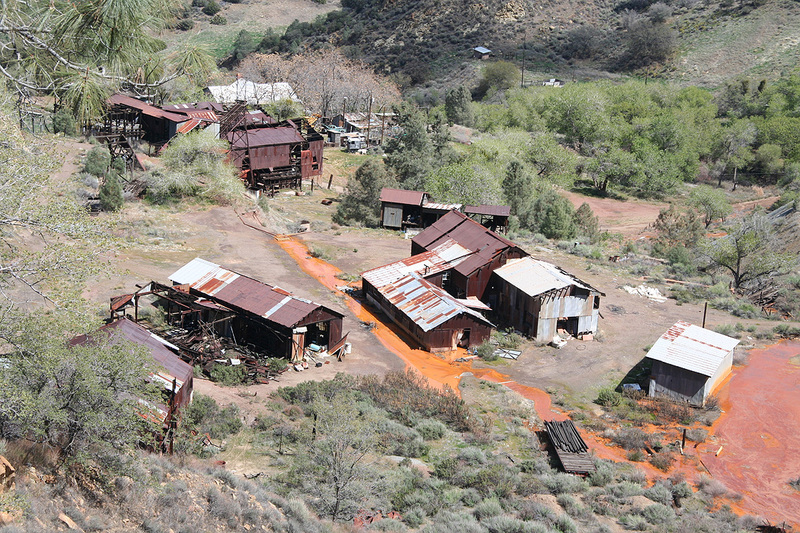 There was a large quicksilver mine operating here from 1857 until 1974. The place is not exactly friendly in appearance, there are an abundance of "keep out", "no trespassing", "no parking" etc. signs posted everywhere. 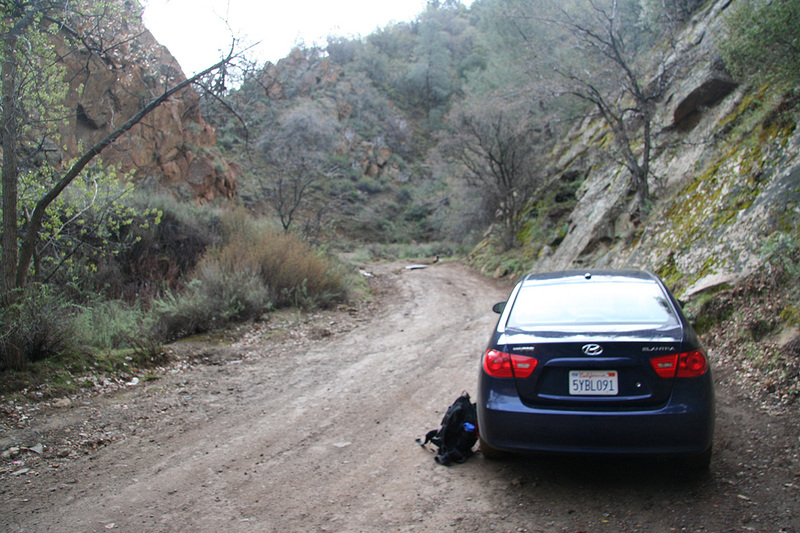 The road that continues is really a 4WD road, however the quality probabely varies considerably. I drove a short section further, then parked at location N36:24.791, W120:40.752, elevation 918 meter. 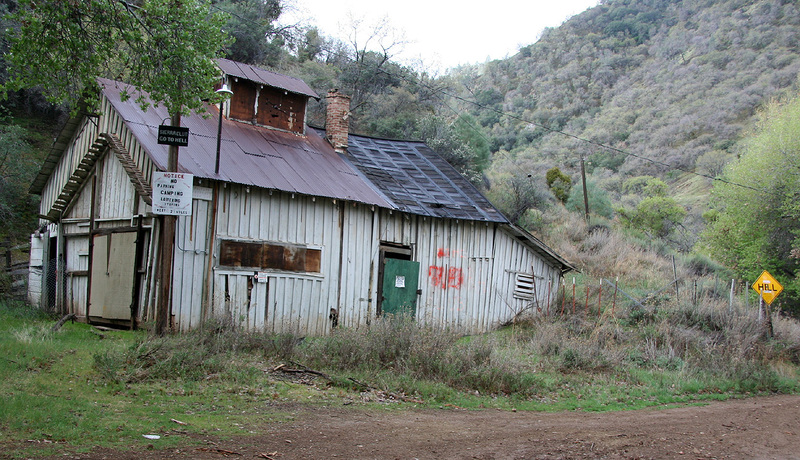 Route description: From the ghost mining town of New Idria, head up the main road. Just above town, there is a road fork. Take the left fork leading up into a small canyon. The right fork may also work, this has not been checked. Continue up the road as it zig-zags and gains elevation. Higher up, the road traverses left and crosses over to a new drainage area. At location N36:23.905, W120:40.560, elevation 1141 meter, there is an information sign as well as some trail signs. 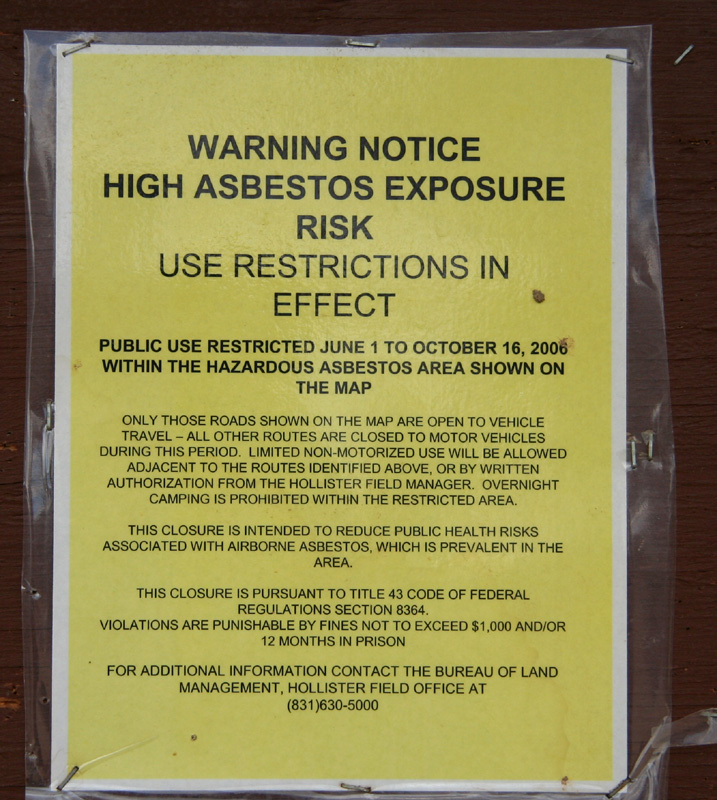 The information sign warns that the area has soil with natural asbestos, thus one should not visit in the area in the summer months (dry season), or when there is substantial wind. The road that heads up to the right has a sign for King City, do not go that way. Proceed straight ahead in the direction of San Benito Mountains. The road climbs gently in a small valley, then contours around a few slopes before more landscape towards the west becomes visible. You pass a couple of signs that mention other names, no San Benito, along the way. However, when you reach location N36:22.263, W120:37.815, elevation 1406 meter, there is a road that forks uphill to your right with a sign saying San Benito, 1 mile. Follow this road, higher up there is a second fork, stay right, this road is signed as a dead end road. 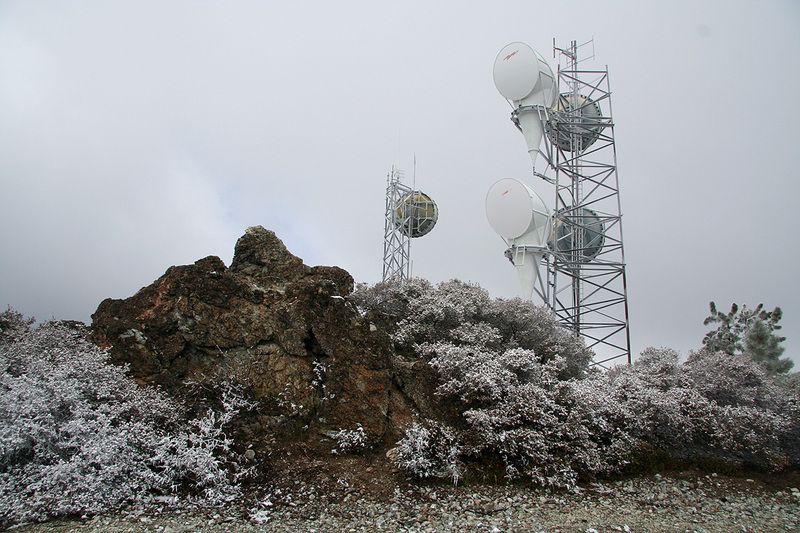 It will lead directly to the summit where there is an antenna complex. Comments: I left Stanfoird at 0545, and parked the car at 0830. I started hiking at 0845 and hit the summit after exactly two hours at 1045. There was a trail register in a can, but it was squeezed and I did not see any point in signing it. I left the summit at 1100 and was back at my car at 1300. The weather was nicer than what the forecast called for. 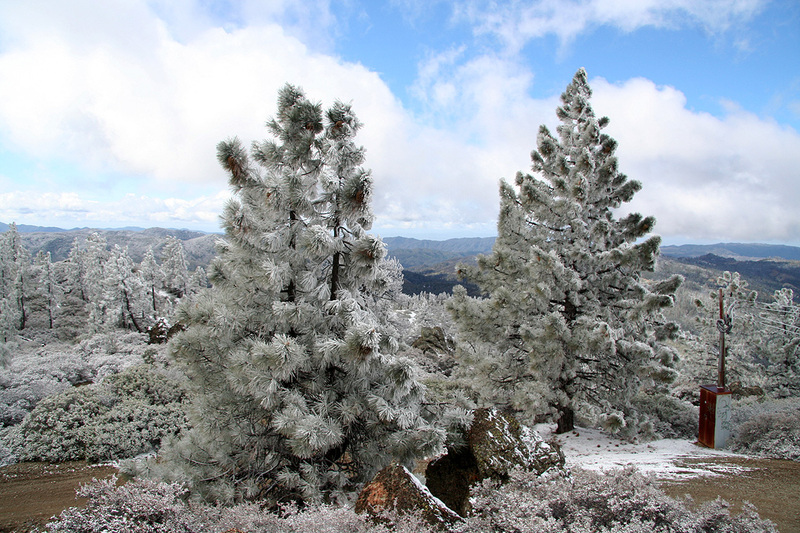 A thin layer of snow had fallen and the icy trees looked beautiful in the sunshine. I had a good hike, spending time to look around at the landscape formations. The next day had a close to perfect weatherforecast and I had planned a car sightseeing down the coast and a climb of the nicely shaped Cone that I had already seen when climbing Junipero Serra. Roadside memorial marker, located where you turn onto Hwy. J1 from Hwy. 25. 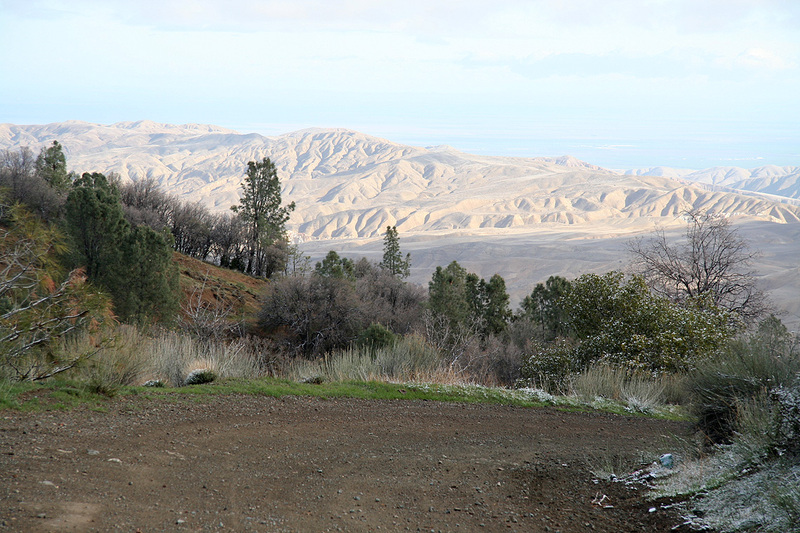 Roadside view towards the Sierra. 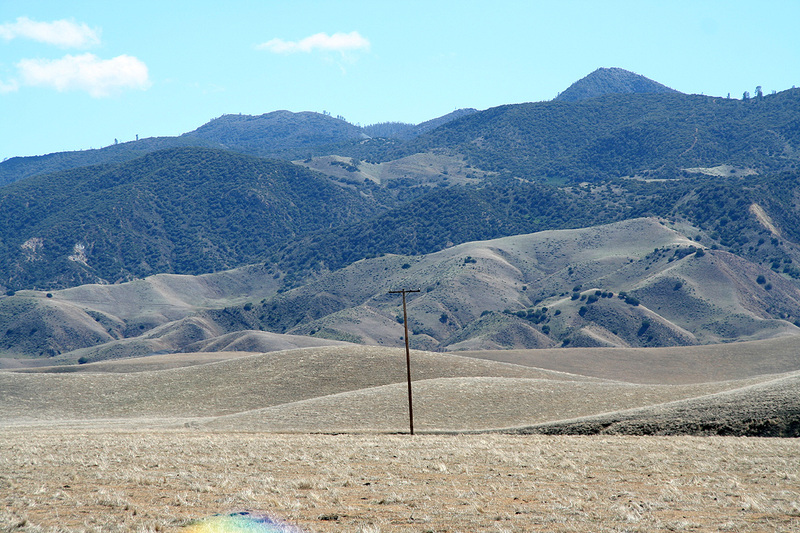 San Benito mountains, as seen when driving near New Idria. New Idria a ghost town. The mines produced mercury (quicksilver), not anybodys favorite substance. Sierra Club go to hell, friendly welcome I. My trailhead, I decided to park as the road was rough. Information signs, dirt road to King City. Asbestos warning, friendly welcome II. 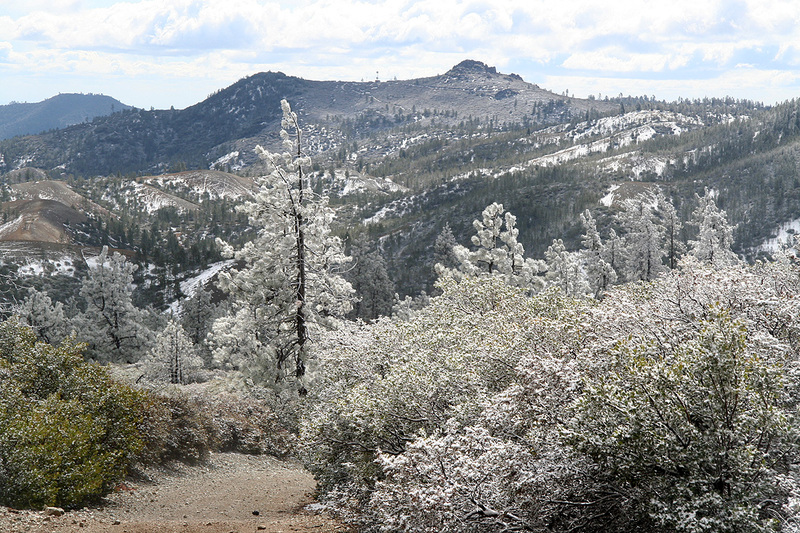 Hiking along the road, a thin layer of snow arrived yetserday. 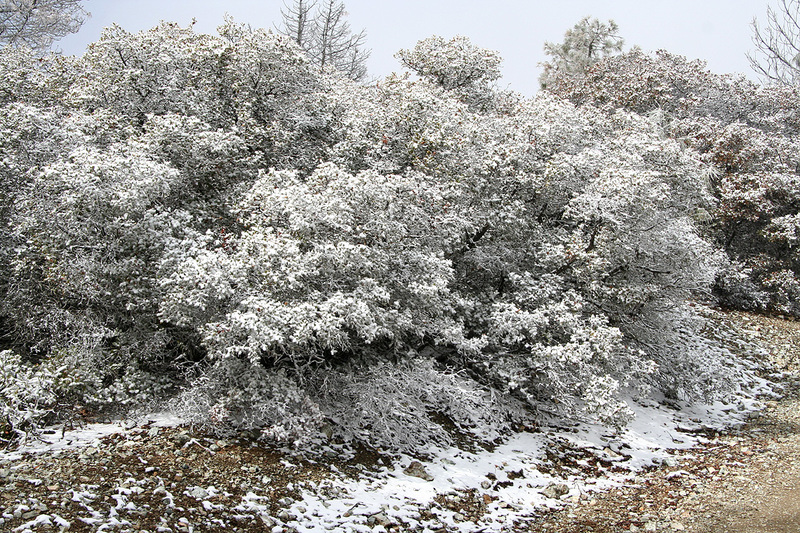 The trees had a nice coating of ice. Summit Panorama IV. 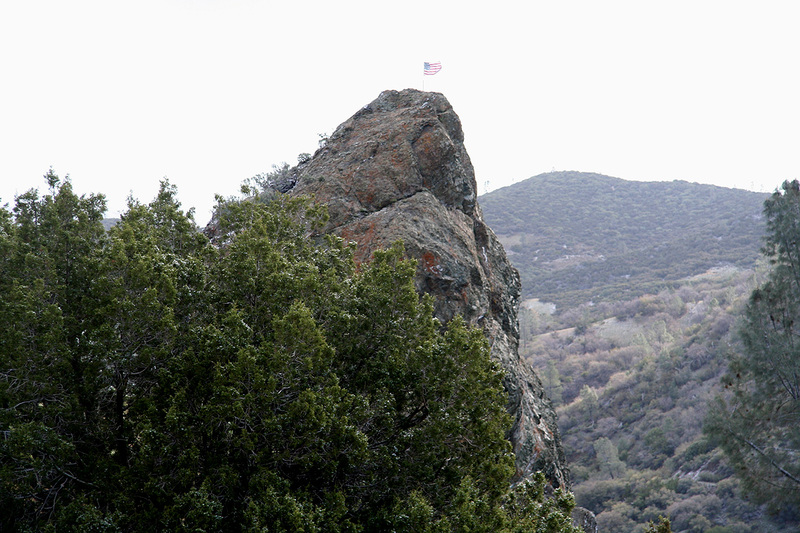 The view is east, a few peaks in the Sierras can be seen.